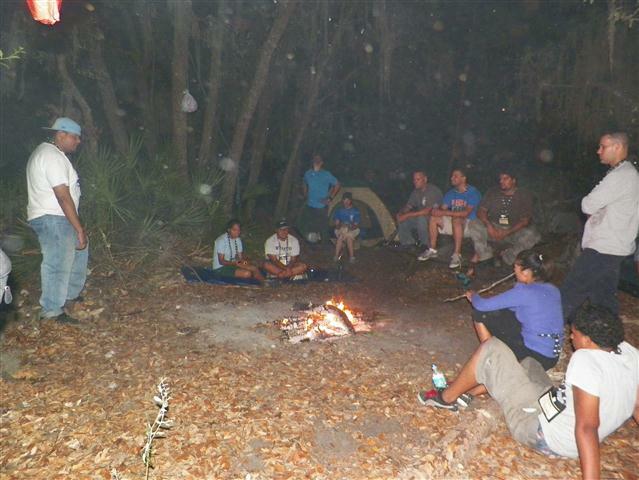 Recently I was asked to take a group of young adults out and teach them some survival basics. The Pathfinders is basically a faith based scouting group. 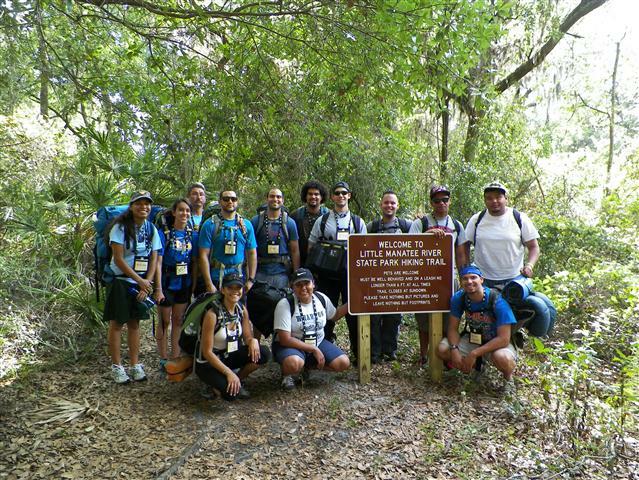 Youth get the opportunity to participate in all the types of events scouts would attend such as camping, canoeing and hiking being surrounded by fellow believers. What a wonderful group of young person’s! Everyone was very well mannered and kind to each other and everyone was included in all the activities. We met around 4 in the afternoon of a Friday for a 1 night “Intro to Backpacking” hike. 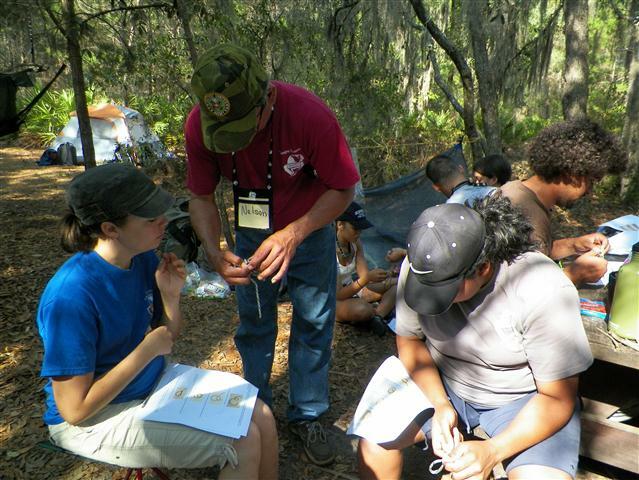 We would cover all the basics, fire making, hydration, know tying, outdoor ethics and other basic skills. 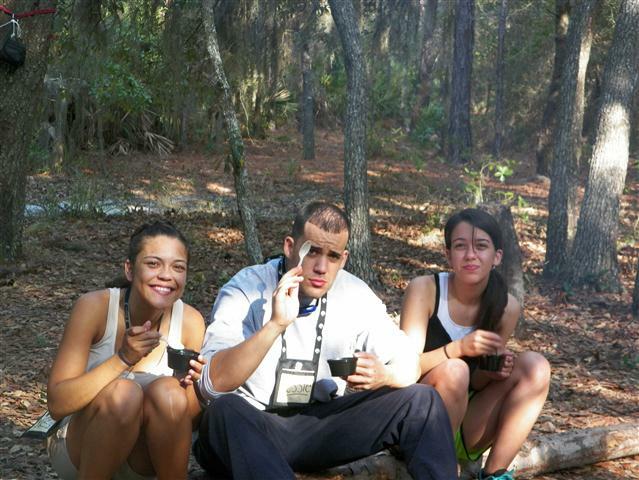 Our round trip hike would be approximately 7 miles with primitive camping over night. After fitting everyone with gear, spreading out the weight of tents, food and water we hurriedly hiked into camp beating the threat of bad weather and fighting very high humidity and temperatures. We stopped a few times to look at animal tracks, changes in the environment and discuss wild edibles. 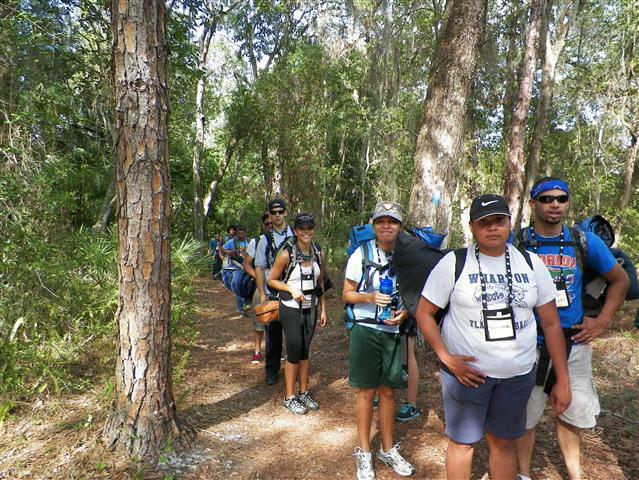 At the creek about 30 min out from camp we filtered water and took a bunch of group pictures. 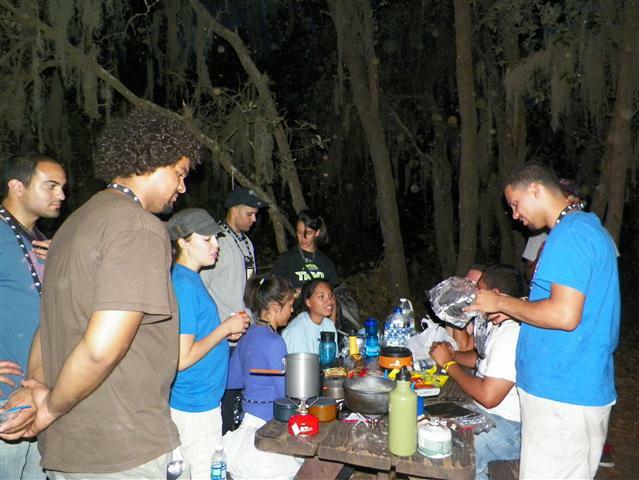 Upon arriving at camp we all shared in the task of setting up camp, gathering firewood, and preparing for dinner. One thing everyone had to do before heading out was to learn to start a fire from scratch. Everyone was successful! I just wish I would have had more time to show them about what to do after they got flame! Dinner included a variety of meal options. We had many different options to show what all could be packed into the woods yet still taste good and fill their bellies. We all had fun discussing snakes, armadillos and even big foot over dinner! Then we found a tree and hung the trash from “Coonzilla” who frequents this campsite. After dinner the group got together to sing songs of praise around the campfire and they had a worship service there under the stars. It was such a moving experience to see all of these twenty-something kids openly discussing and sharing their faith! It was a very hot evening and the campfire did not last long. Everyone was soon in their tents and trying to stay cool enough to sleep. In the middle of the night it was still so hot, many just got up and visited late into the evening sharing stories waiting for it too cool down. Morning came and many of the youth wanted to sleep in, so I hiked about 30 min down to the river with one of the early risers to get water for camp. When we got back everyone started moving about and they were very hungry! We could already tell it was going to be another very hot day. After breakfast was cleaned up it was time to learn how to tie a few common survival knots. After they all got those few down we pulled out a deck of cards that were full of advanced knots and boy did they have fun trying to “one up” their buddies! We took time for an introductory class in Leave No Trace Outdoor Ethics and then we broke camp. It was about 10 am when we hit the trail and it sure was a hot hike. 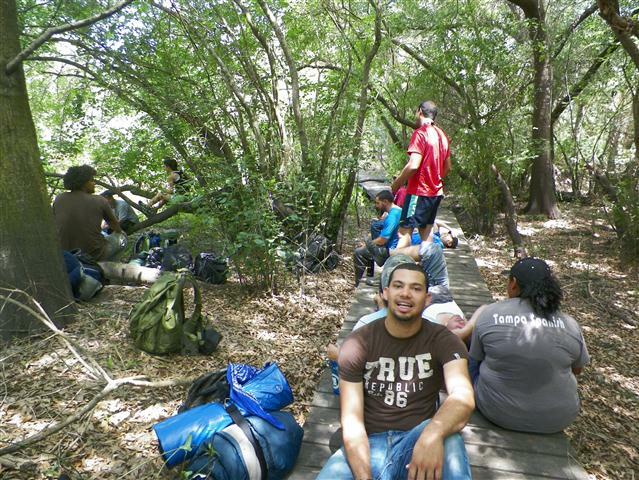 We were grateful for the heavy shade for most to the hike the 2ndday and everyone enjoyed a stop by the river! Everyone though tired was in very good spirits. They sang often as we hiked down the trail. I stopped occasionally to quiz them on the direction of travel and even once took them “off-trail” to see if they were paying attention or just following the leader. 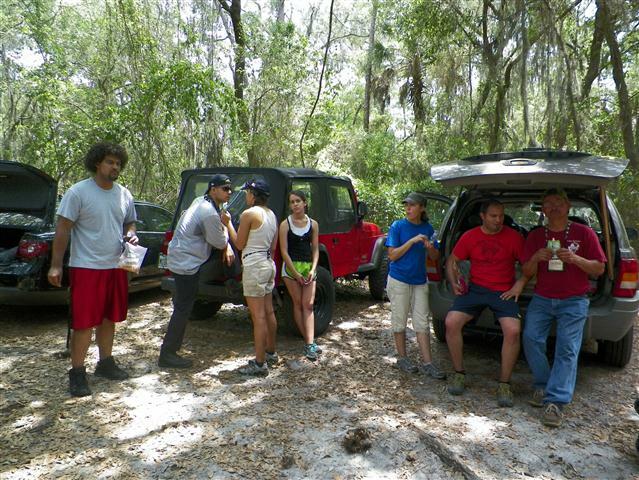 Upon arriving back at the trailhead everyone was beat. We gathered around the vehicles and all consumed a bottle or two of water. Packs were emptied and goodbyes said. It was sad to see this bunch go, but I look forward to an advanced multi night hike in the fall with them!